The Turkey Chapter of the Association for Information Systems (TRAIS) is a Chapter of the Association for Information Systems (AIS) serving Turkey. The purpose of the TRAIS is to promote the exchange of ideas, experiences, and knovvledge among scholars and professionals in Turkey engaged in the development, management, and use of information systems and technology. TRAIS was elected as one of the best performing country chapters for two years consecutively! 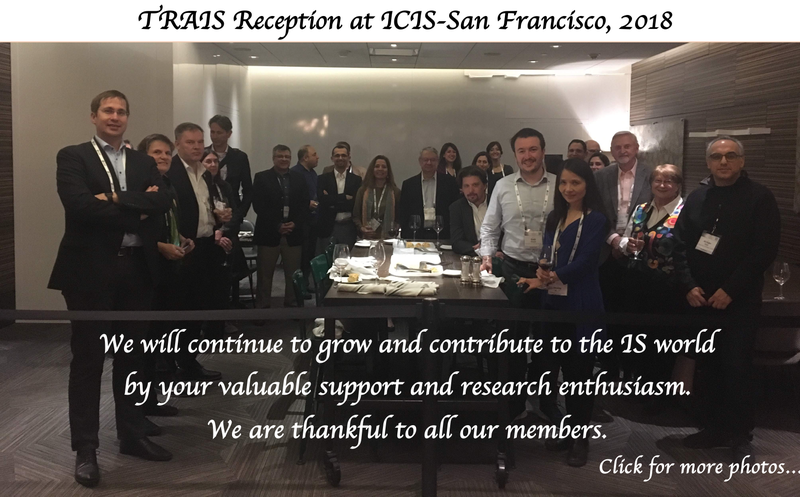 We proudly announce that the AIS Turkey chapter, TRAIS, was elected to earn the designation of Outstanding Chapter for both 2016 and 2017. TRAIS became a strategic partner to the prestigious IDC Conferences that attracted hundreds of professionals from the IS world in Turkey. IMSC is the only conference affiliated in Turkey by TRAIS and it is also in the process of being affiliated by AIS. TRAIS organized the junior faculty workshop (October 26, 2018) at IMISC. 5th conference will be held at Yıldırım Beyazıt University, Ankara, on October 24-26, 2018.